ISO is the measure of the camera's sensitivity to light, and increasing the ISO setting means you can shoot in dimmer lighting. But where most regular cameras top out at ISO 6,400-25,600, the Canon ME20F-SH is over 150 times more sensitive. In exposure terms, that means it's around 7.5EV ('stops') more sensitive. Previous record-holders have included the Nikon D4S pro DSLR and Sony's high-speed, low-light specialist the A7S, but both can only scrape up to ISO 409,600 – impressive in itself, but a long way behind the Canon ME20F-SH. This camera, to use Canon's own words, can 'see the unseen'. It can record full-colour, full HD movies where previously film-makers might have had to settle for black and white footage shot using special infra red lighting. The ME20F-SH does not, however, represent a breakthrough in digital capture technology. Instead, it's a highly-specialised product which makes massive compromises in order to achieve this sensitivity. The physics are pretty simple. It uses a full-frame sensor with huge photosites (pixels) to capture as much light as possible. Where the light-gathering photosites on regular sensors are like thimbles, the photosites on the ME20F-SH are like buckets. However, if you want bigger photosites it means you can't squeeze so many on to the sensor. The ME20F-SH's photosites are so big (5.5 times larger than those in regular full-frame cameras) that it has only 2.26 million, which is roughly one-tenth the resolution of a regular camera. This means it can shoot full HD video but not 4K, and it's no real use for stills, either. So we probably could have ISO 4 million on stills cameras right now, provided we didn't mind 2-megapixel images. And having a budget of $30,000 (about £19,200, AU$41,200) would help, because that's the price of this new camera. That stratospheric price tag reflects the extremely specialised technology used to give the ME20F-SH its amazing low-light capability. It's designed for use in the most dimly-lit situations, such as nighttime wildlife photography, deep-sea diving, caves, astronomy and – creepily – surveillance. 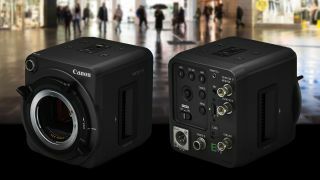 Canon says it can be installed in a location semi-permanently and operated remotely. Like Canon's EOS Cinema cameras, the EOS ME20F-SH takes interchangeable EF mount lenses. If you're interested, though, you will have to join the queue. The ME20F-SH will not be available until December 2015, and even then only through selected partners.